An afterthought adventure turned into an exciting exploration on a weekend in October. With little time to spare, my wife and I decided to take a quick diversion into the forest. Our time constraints limited us to a short hike at one of the southernmost glacial lakes in the US. After just a few steps into the trail, we stopped. The floor of the forest captured our attention; it moved. We noticed the first of many orange salamanders, or more specifically, Eastern (Red-Spotted) Newts. These little creatures were hiding under cover or quickly scurrying off the trail, seemingly trying to avoid us. Their bright orange color is a stunning display against the greens and browns of the trail in autumn. 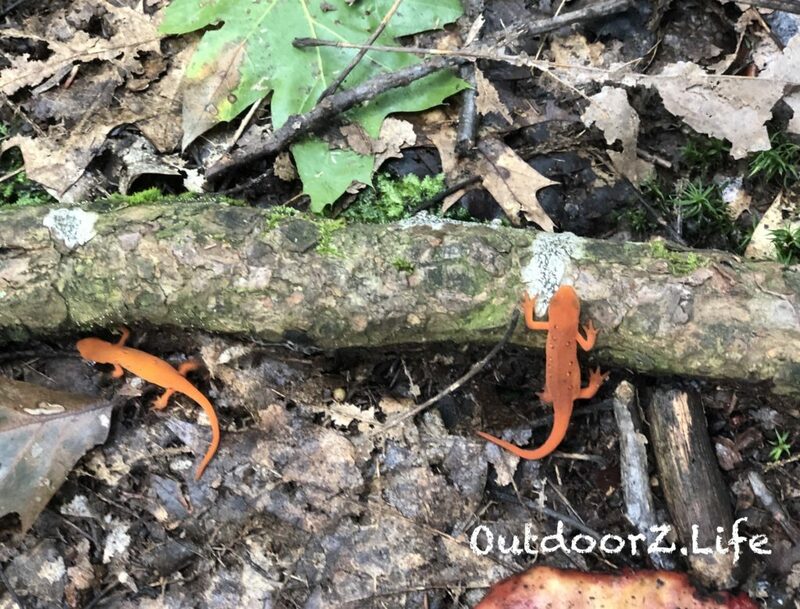 Eastern (Red-Spotted) Newts on the trail. We couldn’t help but wonder if their brilliant color made them easy prey for wildlife looking for a quick snack. It turns out, this color is a warning sign to predators that this little Newt produces a poisonous toxin. Hungry predators would be wise to look for another source of food. Making our way through the preserved forest, we noticed a variety of mushrooms. Mushrooms happen to be my favorite pizza topping. I know that some wild mushrooms are safe to eat while others are poisonous. Since that is the extent of my knowledge, I limit my intake of mushrooms to those from the grocery store or from a local pizzeria and rely on the experts for mushroom education. 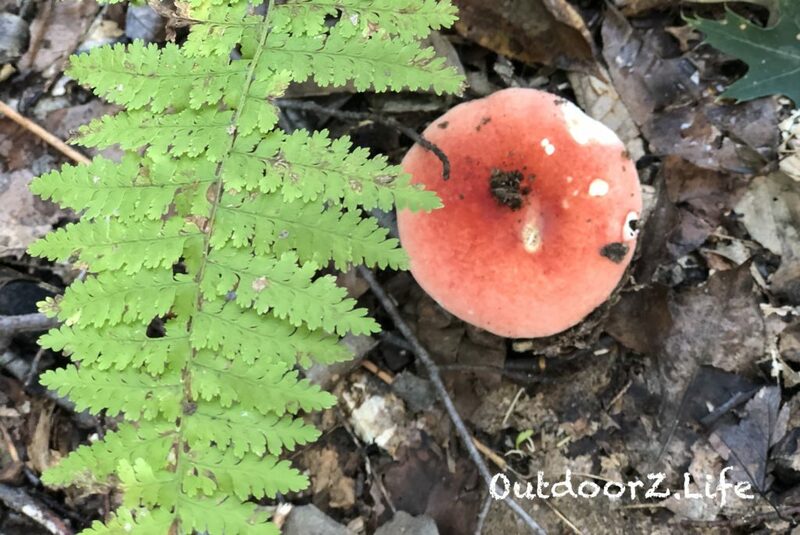 A mushroom and fern next to the trail. As we continued down the well-marked trail towards the glacial lake, we encountered many unique colors on or near the ground. Leaves get most of the attention this time of year, but colors abound everywhere. 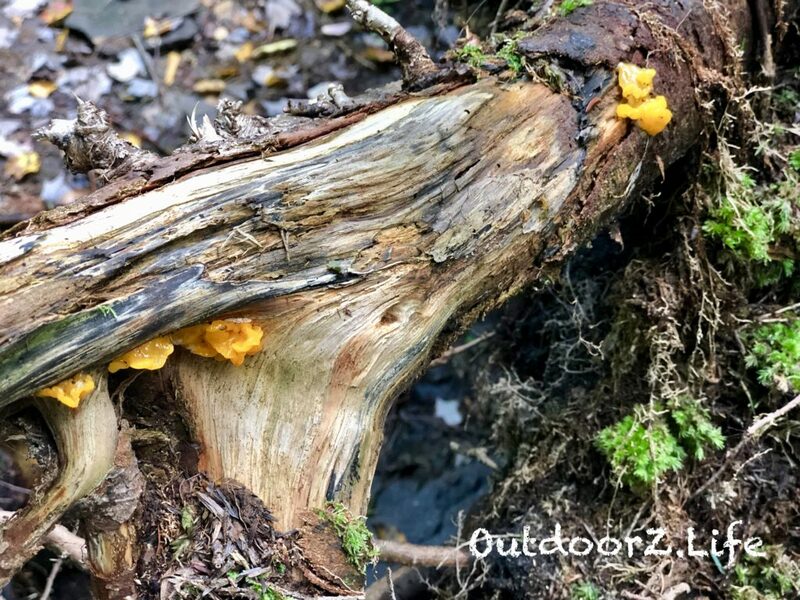 One dead tree and some layers of fungi can be so interesting. We had set out for a quick hike to a beautiful lake, but as the saying goes, our life experiences are more often about the journey and not just about reaching a destination. While autumn is my favorite season due to the change in weather and leaf colors, Christmas is my favorite Holiday. Just prior to reaching the lake we were prompted to think of what is to come. According to the US Forest Service, Partridge Berries (officially called Mitchella) were named after a physician who developed a treatment for yellow fever. 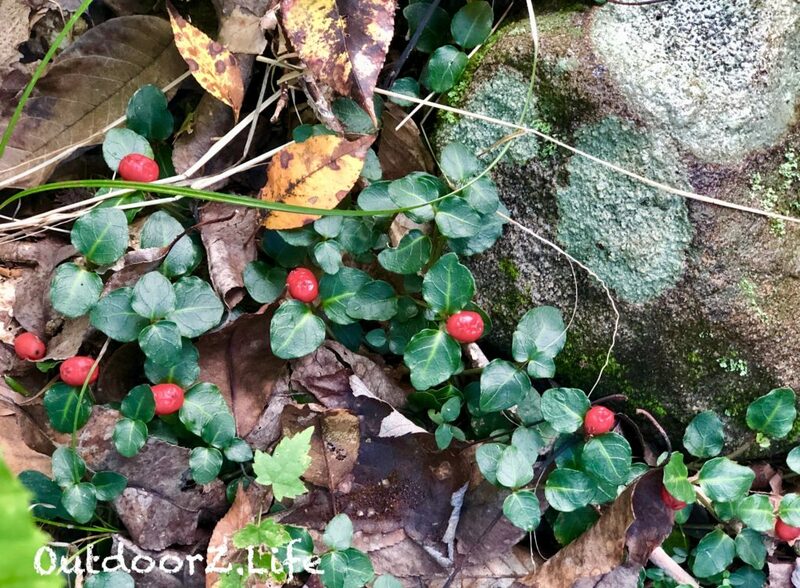 This plant immediately caught our attention with its bright red berries, complemented by its deep, green leaves. What could be better than being outside on an autumn day and having the “trail” point us towards Christmas? I suppose this is a good reminder to make the most of the current season while looking ahead with expectation and hope to the next. Partridge Berries (Mitchella) reminded us of Christmas. The fact that our hike was a mere 1.24 miles, reminds me that wonders can be found if we just explore. The good news is that exploration can occur in our back yard, on a short hike, or just about anywhere. Exploration can happen without the latest equipment or without being the most experienced. Exploration is possible with a curious mind and a willing body. In our case, we did make it to Lake Lacawac just in time for the clouds to part and reveal a blue sky. This glacial lake, our destination that day, serves as the basis for environmental education and research. The journey, as often is the case when we get outdoors, surprised, amazed and educated us. Click here for an NJ hike that impresses folks from the Rockies. Located in the Pocono Mountains of Northeastern Pennsylvania and founded in 1966, the aspirations of Lacawac Sanctuary has been to preserve Lake Lacawac, its watershed, the surrounding forest and historic structures; provide a venue for ecological research, scholarly interaction and the training of scientists; provide PreK-12 and collegiate education on environmental and conservation issues; educate all ages and promote healthy living patterns and wellbeing through nature.